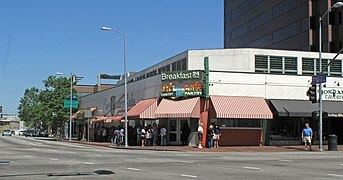 Figueroa Street is a major north-south street in Los Angeles County, California, spanning from the Los Angeles neighborhood of Wilmington north to Eagle Rock. 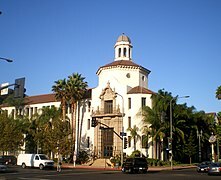 The street is named for General José Figueroa (1792 – September 29, 1835), governor of Alta California from 1833 to 1835, who oversaw the secularization of the missions of California. Figueroa Street (left), Harbor Freeway (center), and S Broadway (right) night aerial from the south, with downtown Los Angeles in the distance. Figueroa Street turns and become less visible at the University of Southern California. One of the longer streets in the city, it runs in a north/south direction for more than 30 miles (48 km) from its southern terminus at Harry Bridges Boulevard in the Wilmington neighborhood to Chevy Chase Drive in the city of La Cañada Flintridge at the north end. From its south end at Harry Bridges Boulevard to Downtown Los Angeles, Figueroa Street runs north parallel to the Harbor Freeway (Interstate 110) in South Los Angeles. The only portion of this segment of Figueroa Street that lies outside Los Angeles city limits is in the city of Carson. 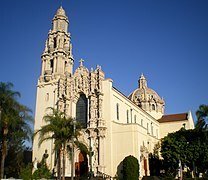 South of the Los Angeles Financial District, Figueroa Street passes well-known locations including the University of Southern California, the Los Angeles Convention Center, and Staples Center/L.A. Live. After passing through downtown Los Angeles near Bunker Hill and South Park, the southern portion of Figueroa Street ends near the overcrossing of Sunset Boulevard over the Arroyo Seco Parkway (SR 110). The street resumes at San Fernando Road in Cypress Park. An early routing of Figueroa Street in this area was originally part of U.S. Route 66, today a part of the Arroyo Seco Parkway (State Route 110). The noted Figueroa Street Tunnels were once a part of that same stretch of roadway. After resuming at San Fernando Road, Figueroa continues to run roughly parallel to the Arroyo Seco Parkway until it reaches York Boulevard in Highland Park. Afterwards, it heads north to its terminus with the Ventura Freeway (State Route 134). A short, unconnected continuation of Figueroa runs from just south of Marengo Drive in Glendale to end at Chevy Chase Drive just over the city limit line in La Cañada Flintridge. 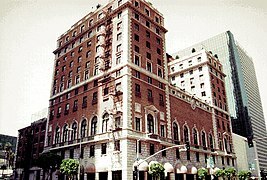 Early maps produced by the Automobile Club of Southern California measured distances to Los Angeles from the club's headquarters at the intersection of Figueroa Street with Adams Boulevard. 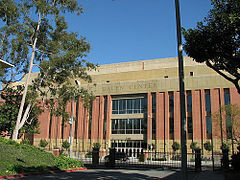 On April 2, 2011, a portion of Figueroa Street at Jefferson Boulevard was blocked off for the "Orange Carpet" and the grandstand for the broadcasting of the 2011 Kids' Choice Awards. 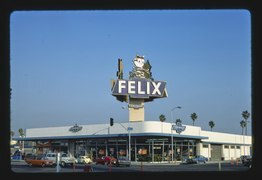 Figueroa was originally called Calle de los Chapules (or Grasshopper Street). Later in the 1880s it became known as "Pearl Street". The section of what is now Figueroa in Highland Park above Avenue 39 was known as "Pasadena Avenue" until Figueroa was extended through Elysian Park. 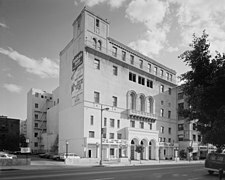 The portion of what is now Figueroa between the Los Angeles River and Avenue 39 was originally known as Dayton Avenue until the Arroyo Parkway went through. Metro Local Line 81 bus stop at Figueroa and 65th Streets, Los Angeles, California. Metro Local Line 81 runs on Figueroa Street. The Metro Green and Silver lines operates a station underneath Interstate 105 at Figueroa Street. Metro Local Line 81 operates on Figueroa Street between Colorado Boulevard and Interstate 105 and Torrance Transit Line 1 between Interstate 105 and the Harbor Gateway Transit Center. The Metro Expo Line has 5 stations nearby. Two of which are shared with the Metro Blue Line, one being a major hub connecting to the Metro Red and Purple lines. The Metro Silver Line runs on Figueroa Street in Gardena and between 23rd and 6th Streets in Downtown: Northbound Silver line trips to El Monte Bus Station continue north on Figueroa Street to serve the 7th Street / Metro Center and finally turn right on 6th street, leaving Figueroa Street. Southbound Silver Line trips to Harbor Gateway Transit Center or San Pedro run south on Flower Street from 5th Street to the Harbor Transitway. There are 6 Silver line street stops located on Figueroa Street: Figueroa/190th/Victoria; Northbound only: Figueroa/23rd, Figueroa/Washington, Figueroa/Pico, Figueroa/Olympic, and Figueroa/7th . In addition, there are 7 Metro Silver Line Stations served on the Harbor Transitway and Harbor Freeway close to Figueroa Street: 37th Street/USC, Slauson, Manchester, Harbor Freeway, Rosecrans, Carson, and Pacific Coast Hwy. The Harbor Transitway is located on the I-110 freeway, between Figueroa Street and Broadway. The Lincoln/Cypress Station for the Metro Gold Line on Avenue 26 at its intersection with Lacy Street is about a 5-minute walk from Figueroa Street. ^ Lucas, Greg (2011-09-29). 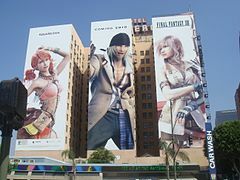 "The Streets of Los Angeles". California's Capitol. Retrieved 2017-05-16. Grasshopper Street – Calle de los Chapules – is now Figueroa which, in turn, is a tip of the hat to the former Mexican Governor Jose Figueroa. ^ "California Proposition 1C, Bonds for Housing (2006)". Retrieved 2017-05-16. ^ Barragan, Bianca (2016-06-10). "Bikeable, Walkable Figueroa Actually Is Coming Soon". Curbed. Retrieved 2017-05-16. ^ "What is MyFig?". myfigueroa.com. Retrieved 2017-05-16. ^ "Stage 1: Vision, Games Concept and Strategy" (PDF). la24.org. 2016-02-12. Retrieved 2017-05-16. 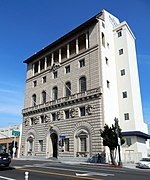 Wikimedia Commons has media related to Figueroa Street.